This is a picture I made to put inside a snow globe for my friend’s birthday. 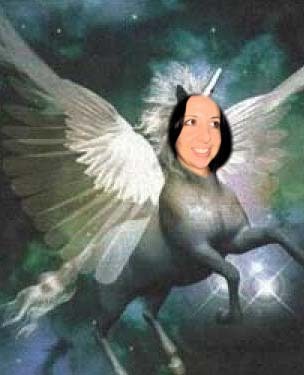 I call it ‘Me As Unicorn’. I’m sorry. I just had to get the voices out of my head. I’m on the cusp of turning 30 and am suddenly freaked out that by all the things I haven’t done. So, I quit my job, headed to Eastern Europe, travelled around, came back to Australia, and now I’m writing like a fiend. I’ve spent my 20s trying (and sometimes failing) to be responsible so I think this means I can make more irresponsible decisions in my 30s. Looking forward to it! My sense of humour has been described as sarcastic, dark, cynical, silly and ‘I’m sorry, I don’t understand’. On occasions, it has been described as good so thought I might try sharing beyond my usual crowd (small dinner table of family members/friends/work colleagues). When I’m not trying to be hip with the kids of today at bars and live music venues, I’m at home reading 19th century English literature, making pots of tea, sewing 1950s style frocks, talking to my dog, and reading the Internet with Urban Dictionary open in a separate browser window alongside.